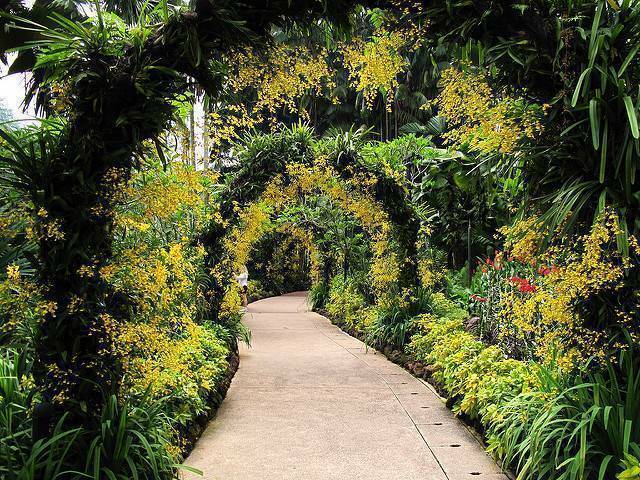 The National Orchid Garden is located on the highest hill in the Singapore Botanic Gardens. Three hectares of carefully landscaped slopes provide a setting for over 1,000 species and 2,000 hybrids, with about 600 species and hybrids on display. The National Orchid Garden was inaugurated on 20 October 1995 by Mr Lee Kuan Yew and it also offers free entry to the garden for students during the first week of every school term holidays in March, June, September and November. The distinctive feature and major attraction of the National Orchid Garden that should not to be missed are its design concept which presents the display of plants in four separate colour zones over most of its areas-"Spring" zone with its prevailing colours of bright and lively shades of gold, yellow and cream flowers. "Summer" zone consists of major tones of strong reds and pink flowers. "Autumn" zone of matured shades while the "Winter" zone comprises of whites and cool violet shades.